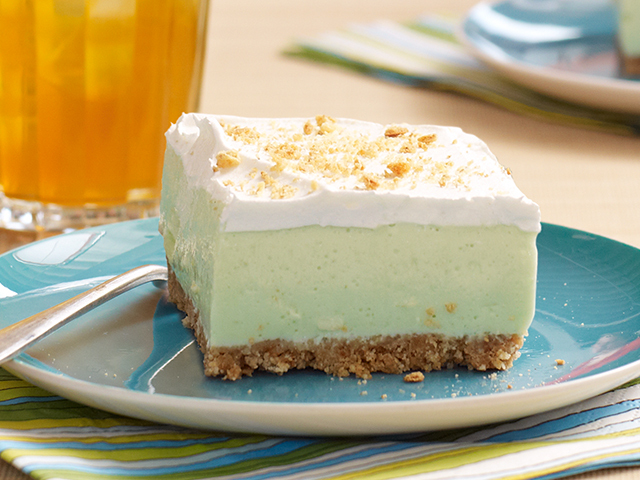 Fans of key lime pie will jump for joy when they try these dessert squares, made with sugar-free JELL-O, low-fat sweetened condensed milk and lime juice. Line 9-inch square pan with plastic wrap, with ends of wrap extending over sides. Reserve 1 Tbsp. graham crumbs. Mix remaining crumbs with butter; press onto bottom of prepared pan. Refrigerate until ready to use. Add boiling water to gelatin mix in small bowl; stir 2 min. until completely dissolved. Add ice; stir 2 min. or until thickened. Remove any unmelted ice. Beat Neufchatel in medium bowl until creamy. Gradually beat in milk, then lime juice. Add gelatin; mix well. Whisk in 1 cup COOL WHIP. Pour over crust. Refrigerate 6 hours or until firm. Cover with remaining COOL WHIP just before serving; sprinkle with reserved crumbs. Use plastic wrap handles to remove dessert from pan before cutting into squares. Small ingredient substitutions, such as JELL-O Lime Flavor Sugar Free Gelatin, PHILADELPHIA Neufchatel Cheese, low-fat sweetened condensed milk and COOL WHIP LITE Whipped Topping result in a savings of 40 calories and 3 grams of fat per serving when compared to a traditional recipe.